Chris’ dad, Richard, is a a big fan of curling and is involved with his local curling club. A few weeks ago his club hosted The Dominion Bonspiel, which had entries from teams all over Canada. 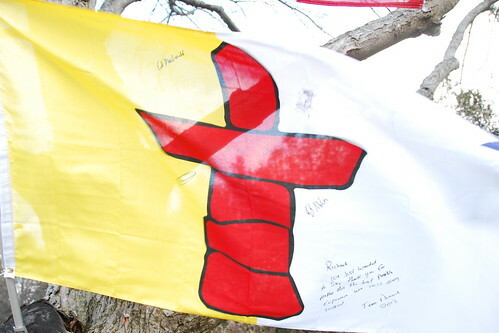 Richard was the driver and flag bearer for a team that came from Nunavut. At the end of the weekend they signed a flag for him to keep as a thank-you. 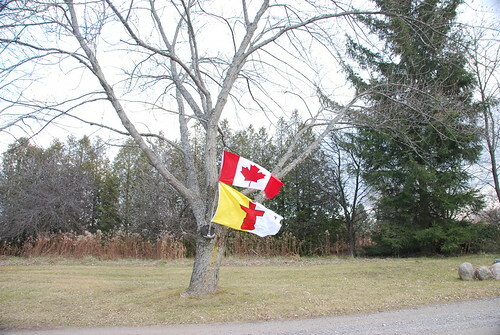 He and his wife hung the flag outside their home. We were forwarded this email about what happened after that. We are so happy to hear that they were able to preserve the signatures from such a memorable weekend. I hear that they are going to find a spot indoors to hang the flag so that it doesn’t get hit with any further damage. Have fun curling!